David Gordon spent many years on the opera and oratorio stages of the world. The Chicago Tribue called him "one of the world's great Bach tenors." David is the author of The Little Bach Book, a unique look at Bach and daily life around him. There is no other book like this in English or in German! In the 1720s, Leipzig was a thriving city with a population of 30,000. What did the residents eat, drink, and wear? How did they bathe and cook? What fuels heated and illuminated their homes? 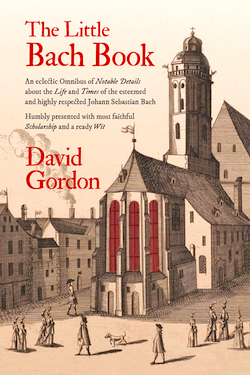 Until now no book has described the details of daily life in Germany during Bach's lifetime. "I was obliged to work hard. Whoever is equally industrious will succeed just as well." Now there is music from which a man can learn something. Whether the angels play only Bach praising God, I am not quite sure. To strip human nature until its divine attributes are made clear, to inform ordinary activities with spiritual fervor, to give wings of eternity to that which is most ephemeral; to make divine things human and human things divine; such is Bach, the greatest and purest moment in music of all time. Bach is like an astronomer who, with the help of ciphers, finds the most wonderful stars. And if we look at the works of JS Bach - a benevolent god to which all musicians should offer a prayer to defend themselves against mediocrity - on each page we discover things which we thought were born only yesterday, from delightful arabesques to an overflowing of religious feeling greater than anything we have since discovered. And in his works we will search in vain for anything the least lacking in good taste. "She played Bach. I do not know the names of the pieces, but I recognized the stiff ceremonial of the frenchified little German courts and the sober, thrifty comfort of the burghers, and the dancing on the village green, the green trees that looked like Christmas trees, and the sunlight on the wide German country, and a tender cosiness; and in my nostrils there was a warm scent of the soil and I was conscious of a sturdy strength that seemed to have its roots deep in mother earth, and of an elemental power that was timeless and had no home in space." ...the greatest Christian music in the world...if life had taken hope and faith from me, this single chorus would restore all. Bach is the beginning and end of all music. I had no idea of the historical evolution of the civilized world's music and had not realized that all modern music owes everything to Bach. Music owes as much to Bach as religion to its founder. Bach is thus a terminal point. Nothing comes from him; everything merely leads to him. O you happy sons of the North who have been reared at the bosom of Bach, how I envy you. ...the most stupendous miracle in all music! Bach is a colossus of Rhodes, beneath whom all musicians pass and will continue to pass. Mozart is the most beautiful, Rossini the most brilliant, but Bach is the most comprehensive: he has said all there is to say. If all the music written since Bach's time should be lost, it could be reconstructed on the foundation which Bach laid. The poetry, the atmosphere, the intensity of expression, the beauty of the preludes and fugues grip, overwhelm, and stimulate us. Let us not be afraid of the supreme contrapuntal science of the fugues, nor be overawed by the stern appearance and heavy wig of Father Bach. Let us gather around him, feel the love, the noble goodness that flow from each one of his phrases and that invigorate and bind us by ties strong and warm. Bach is the supreme genius of music... This man, who knows everything and feels everything, cannot write one note, however unimportant it may appear, which is anything but transcendent. He has reached the heart of every noble thought, and has done it in the most perfect way. Any musician, even the most gifted, takes a place second to Bach's at the very start. In Bach, the vital cells of music are united as the world is in God. If Bach is not in Heaven.....I am not going! When eminent biologist and author Lewis Thomas was asked what message he would choose to send from Earth into outer space in the Voyager spacecraft, he answered, "I would send the complete works of Johann Sebastian Bach." After a pause, he added, "But that would be boasting."